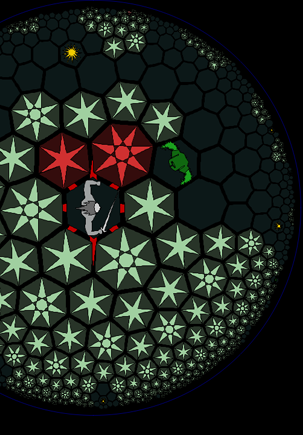 On this year’s Strange Spaces course, which came to an end last week, we were able to show off a visualization of 2-dimensional hyperbolic space thanks to the indie game HyperRogue. Below the fold is a video of someone wandering around on HyperRogue’s space, which students who followed the course might recognise as a Poincare disk. Although it at first appears to be a flat disk, or perhaps a sphere seen from the top, if you look more closely you’ll see the distortions of lines and angles go “the wrong way” for either of these possibilities. This is a space with constant negative curvature: something we have to omagine and represent indirectly because we can’t create such a thing in our own 3D space. Miegakure hasn’t been released yet but hopefully we’ll get to run Strange Spaces next year and use it to add some intuition to this hard-to-visualize subject.